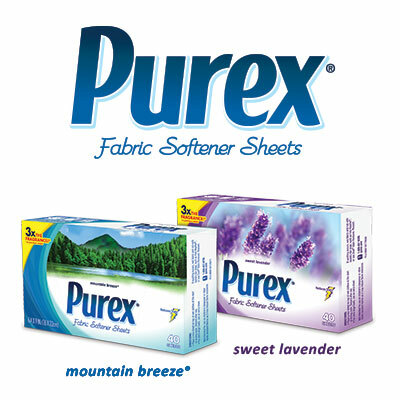 Disclaimer - I received a sample of the Purex Fabric Softer Sheets to facilitate this review. No further compensation was provided and all opinions are 100% mine. I never understood why people bought fabric softener sheets until I moved to North Carolina. I've always had a gas dryer and I've never had a problem with static cling. My new house doesn't have natural gas so we had to buy an electric dryer. Hello static cling, I get it now! I tried the Purex Fabric Softener sheets and I was very happy with the results. My husband's dress socks and shirts are coming out much better now. It's pretty nice not having to pry his socks off of our clothes! I was a little worried that the scent would be too strong, but it is very mild. Brett didn't like the lavender and asked me to buy the mountain breeze scent next time. I can understand that, not too many guys want to smell like lavender. You can win a coupon to try out the fabric softener sheets too! You can enter to win on the rafflecopter form!